गिर behind the wheel. लोल hez playing Mario Kart. HD Wallpaper and background images in the Invader Zim FanCharacters club tagged: gir. XD He's most likely gonna crash. LOL HE FALLS OFF THE CLIFFS!!! DONT HIT PEACH! *crash* AWWWWW POOR PEACH! Me (Sasha): Come on, Zim! play Mario Kart!!!! Itz SUPER FUN!!!! haha!!! Peach is no mach for GIR and I!!!! Miz:*Playn as Bowser*"Bullet pouer up! "*Hits Gir*"Sorry!" 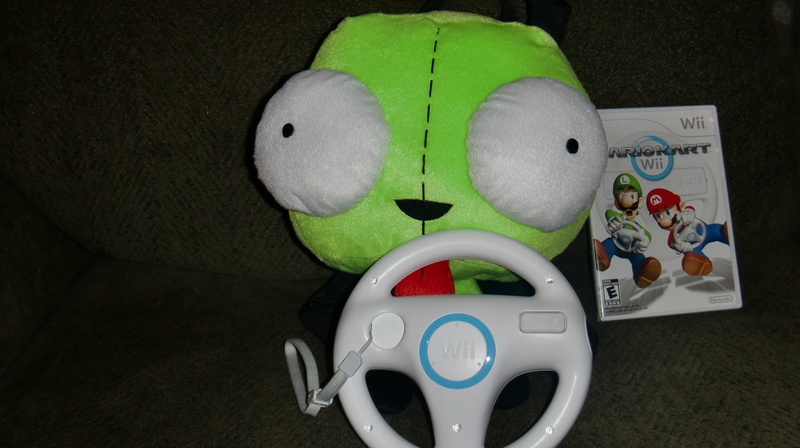 Gir:*Put down the game and goes into defencive mode*"WHY DID YOU DO THAT? I WAS IN FIRST PLACE!" Miz:"You where in the first lap 12th place, I was in the 3'rd lap 2'nd place." Gir:*Goes back to normal, for him. plays the game*"ok."
Mia:*Playen as Rosalinda*"Ha! I got a shell!" Sasha(me):*plays as Luigi* yaay!! !i gotta superstar!!!! *falls off cliff* NOOO!!!!!! *Luigi in game* MAMAAAAAAAAAA!!!!!!!!!!!!!!! HE WON! BY LICKING THE WHEEL! me:*playing as my mii* GIR JUST BUMPED ME OFF OF DK MOUNTAIN WTF!